Typically, after glorious sunny weather for most of the day, the heavens opened at about 4 and it rained/hailed/thundered on and off for the following hour. A few foolhardy souls (Simon, Carmen, David D, Peri, David K and Gordon) ventured forth regardless and were rewarded by a dry (though cold) evening climbing on remarkably non-slimy rock. Routes climbed included Hawk Traverse (a rather fine 22m HS), Castle Corner (a nice though short-lived Diff), Turtle Rocks Chimney (VDiff, the exception to the 'non-slimy' generalisation), plus the old standards of Cracked Corner and Lovers Leap Chimney. Ornithological note – there's an attempt at a nest on the first chockstone of Righthand Crack, constructed by an enterprising but foolhardy bird of unknown origin. after easter break tuesday morning is back on! despite the good weather, Alan, Peri (and pals), Linda and Richard, Warwick and Andrew were all in evidence at the wall on Wed. Debbie was there playing baddminton – pah and i was in a meeting – double pah. some cutting comments about my red 6b on the small overhang ! Once again we were quite late away in the morning as we set of from Corriemulzie Lodge on the 5 mile walk in to Magoos Bothy. 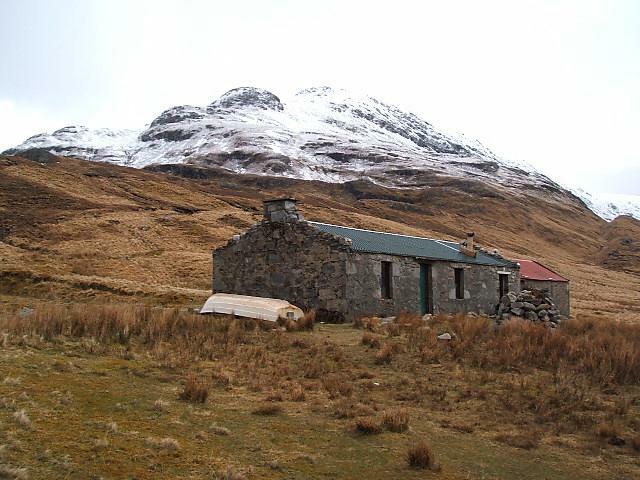 The story behind the place was that an RAF pilot was lost in action in the Kosovo war, in his memory his squadron members renovated his favourite bothy back in 2002. A friend has been hankering to visit the place for sometime after reading the story in a Trail magazine so the knack was to make it into a worthwhile weekend. We arrived in approx 2 hrs had a quick brew & set of to ascend Seana Bhraigh but by which route, now that was the question. As there were some tricky get your feet wet river crossings to be had a group decision was made to walk round the upstream end of the loch. This took us right under the main ridge of Creag an Duine a very impressive ridge that the guidebook described as a grade 2 scramble in summer conditions. Today it was cloaked in snow & ice but the group was up for it so we went on up, gaining the main ridge was tricky with wet snow lying on top of unstable blocks however once the main ridge was gained it eased for a while. 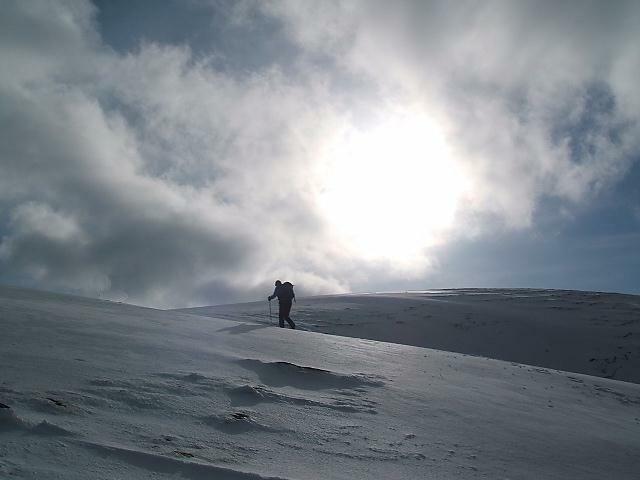 As we gained height the difficulties started again, at first they were easily turned but as the ridge steepened it became more difficult & exposed. The group did fantastic, I had too short rope people up a few sections but generally it went very well, near the top the character of the route changed. It became very exposed & we found some tracks where someone had traversed some ledges to find the best way up. Eventually we solved the problem & 5 of us stood on the summit pinnacle very impressive but we were faced with the option of a difficult down climb, abseil or turning the pinnacle on steep snow slopes. We did the latter and found a continuous grade 1 snow slope back to the summit plateau. 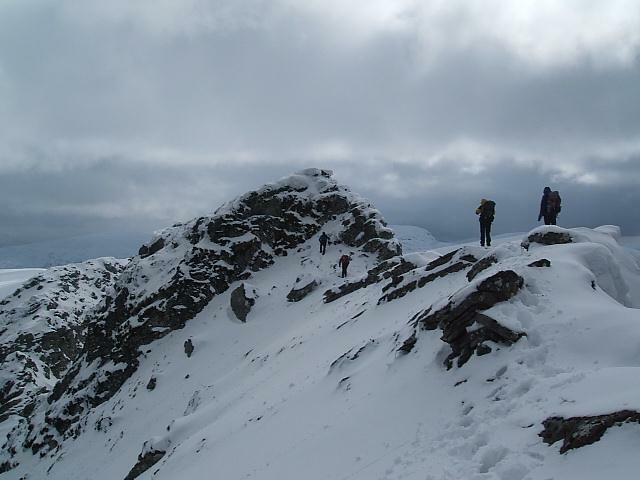 The route may have been a grade 2 scramble but it was a now a grade 2 winter route & well worth doing the route is of a similar quality & difficulty to Ledge Route on Ben Nevis. When we gained the plateau the clouds rolled away and left us with stunning views of the summit and all the surrounding area, the Assynt hills were particularly impressive as too was An Teallach the summit we had climbed the day before. At last we stood on the summit but it was late in the day & the sun was sinking rapidly so we made haste past the summit crags & down the voie normal ridge. 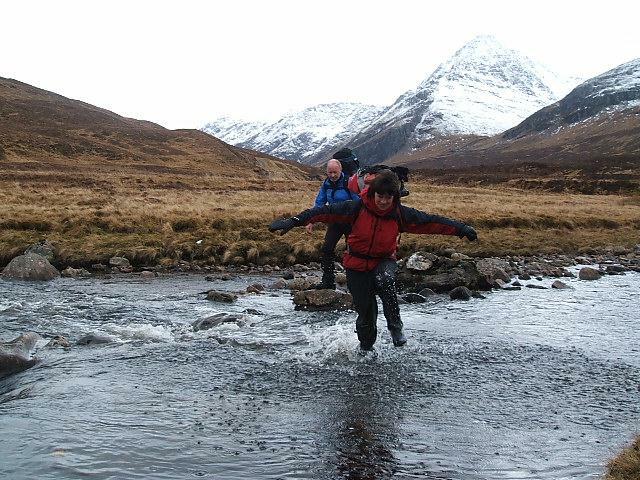 The final obstacle before the bothy was a river crossing where we all got wet but its not to bad at the end of the day. 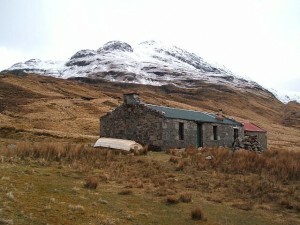 The night in the bothy was quite eventful & some members of the group were a little worse for wear in the morning-a memorable evening. We walked out in the morning and set of on the Long haul south feeling very pleased with ourselves. 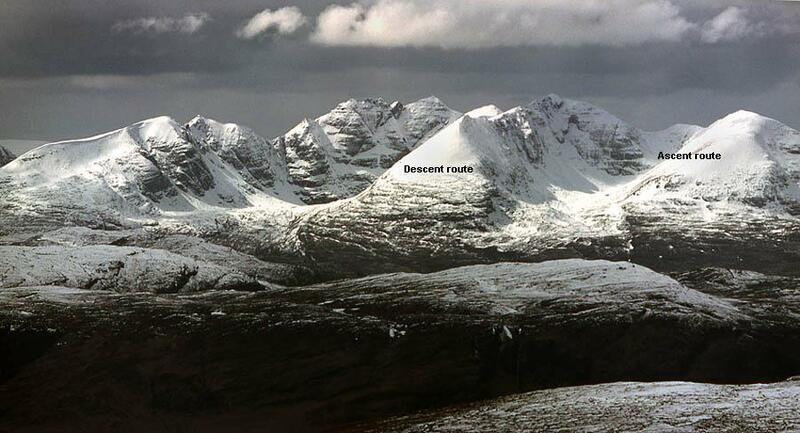 An Teallach had its winter coat on & it was not in a mood to make an ascent easy today, there was a lot of snow about & it was very warm, not a good combination. 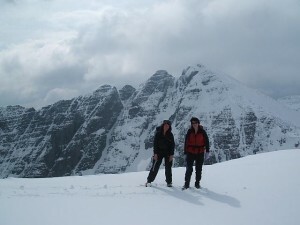 In addition to this we arrived far too late to consider a complete traverse of the mountain so I decided to play safe & bag the 2 munro’s & leave the pinnacles for another day. The traverse route in the guide suggested descending slopes to Glas Thol so this was to be our ascent path today, so we set of from Corrie Halle up a pathless maze of sandstone outcrops, once we reached the upper corrie there were signs of a path but most of it was now obliterated by snow. In addition to this our route in the back of the corrie did not look good with corniced ridges over slushy snow, the route would also have taken us over significant crags, I was not happy & looked for another route. I chose the slopes of a munro top Glas Mheall Mor at 960 metres it was higher than the col but much safer. While we were climbing the clouds rolled back & briefly gave us a tremendous view of the summit with a lot of people on it, looked like a party. 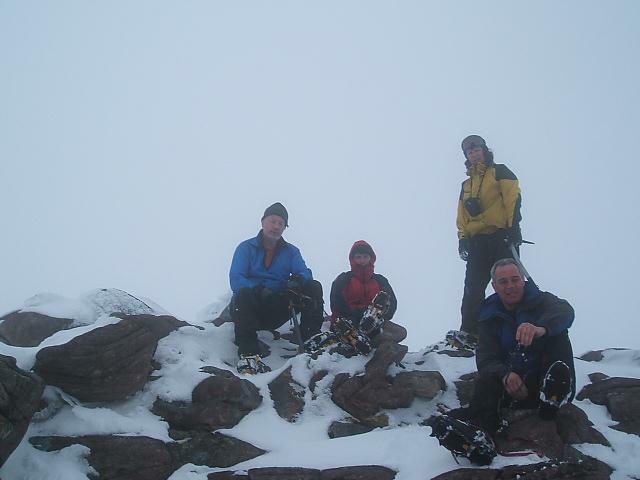 We eventually got up Glas Mheall Mor & ascended to the main summit of Bidein a Glas Thuill, the weather was now detraining & the large group form the summit descending, they were calling it a day & not going for the second summit. Bidein the main summit of An Teallach our decent route followed the ridge (above) to the left. My group were keen to continue so we traversed across to the 2nd Munro Sgurr Fiona & back in poor visibility-hard work. We were then faced with the problem of getting of the hill. It was now quite late in the day, on the ascent we had been looking at the east ridge of the main summit but it had some major pinnacles in the upper section, the map suggested it would be ok, so we thought it was worth a look as it was much shorter than the other options. 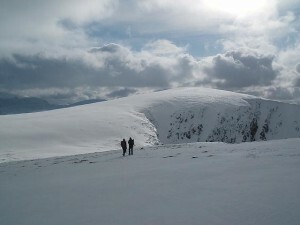 We followed a very impressive ridge down past another munro top Glas Mheall Liath & found a slope we could arseade down. We then found another obstacle with difficult broken ground which eventually led onto a superb sandstone ridge with a cairned footpath back to Corrie Haillie. Back at Ullapool we ate in a lively pub called the Argyll, they had a live blues band playing-Big George & the Business-superb & a good end to a hard day. 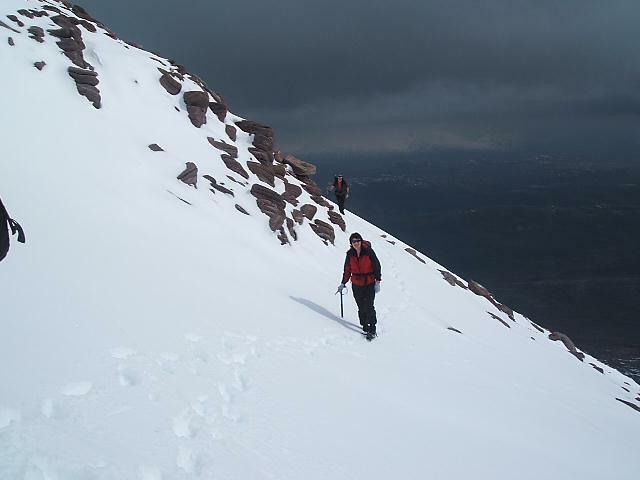 You are currently browsing the York Alpine Club Blog blog archives for April, 2008.